I had lunch with a very pregnant friend the other day. Her feet were puffing out over the straps in her shoes. Her eyes were watery and runny. Her nose was stuffed. Her hips ached and she lumbered, great with child, limping around the head of the baby dropped into her pelvis. And I couldn’t help but smile because I am not pregnant in August. I will never have to endure being pregnant in August again. Of course, being pregnant is a miracle. Of course, each day alone with your baby inside is a gift to cherish forever. But if you’ve ever lived in a hot, humid place and been third-trimester-pregnant in August, you know that it’s also painful and agonizing and puffy and sweaty. You can’t sleep because your bones ache and the baby kicks your bladder. You can’t take any Dayquil when you get a cold. You can’t even drink a beer in the evening. This, too, shall pass. It really will! That’s been my mantra for everything since my first son was born. It doesn’t feel like it’s passing, but every second you make it through something difficult is one less second it will last. Last summer, each day I waddled after my boys, whose energy was not diminished like mine was from growing a human, and wept that I’d be pregnant for the rest of my life. So I’d try to remember to breathe and repeat this, too, shall pass. Because it passes, it passes so quickly that by the time you get your baby home, you’ve forgotten how badly your lower back hurts while you’re pregnant. 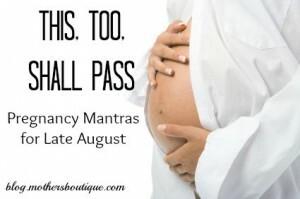 So if you’re pregnant this month and sweating, and having a hard time, try taking deep breaths and reciting this mantra: This, too, shall pass. Did you have a mantra to get you through those swollen, final days of pregnancy? Leave us a comment to share!